These handrail end caps are available in a selection of styles and materials so you can choose one that suits your style, whether it’s a contemporary look you’re going for or a more classic, traditional look. These end caps have a simple but modern appearance. 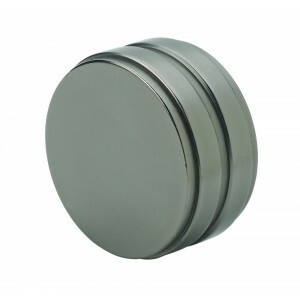 These contemporary-looking end caps have a mat, gun metal finish. Gunmetal finishes are a contemporary satin finish that has a bluish grey tint. The subtle grey of this finish will blend easily into most homes, especially where the décor is contemporary. Combined with the simple, clean lines of this modern bracket this finish is a great alternative to brushed nickel or polished chrome.